My name is Mika I am 16 years old and I LOVE to play soccer. We all have that one thing that makes us happiest in life and mine is soccer. When I'm out there on the field I feel like I am where I belong. Playing soccer is what I do best. 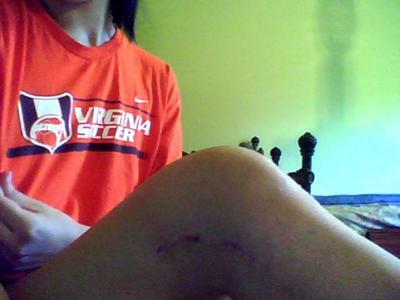 The first time I tore my ACL was when I was 12 years old (young I know). It was an indoor game and I jumped up to get a ball and landed with my leg straight ouch. It hurt but it wasn't like the worst pain you could ever feel. I limped off of the field and sat on the bench the rest of the game. I had ODP olympic developmental program the next day and I felt okay so we got a huge knee brace that I wore during the training. But, I piveted quickly and my knee gave out. The trainer looked at my knee and said it was fine and I could play in a week...sure. So I waited a week and went to practice I just basically limped around the field until my coach yelled at me. We finally went to the doctors after that, I had to have a pediatric surgery which involved a graft. A couple months later I was 14 and playing soccer for the Midwest Regional League in Illinois. I was about to be on a break away after getting by the last defender (she didn't like that very much). So, I was running and she stuck her leg in between mine and kicked me. My left leg stayed planted and it twisted CRACK! owch. Great I thought wonderful JUST WHAT I FREAKIN NEED! Of course the trainer said I was okay again. But, I knew I wasn't so I got some crutches and stayed off of it.Sure enougth it was torn. I got surgery but my growth plates still weren't closed so I had a cadaver which actually an ichelles tendon was used (I have no idea how to spell that). The first 2 tears were both on my left knee, but my third was on my right.